One of the most popular trends we see thanks to celebrities like the Kardashians is workout waist training. In fact, when many of our customers share their shapewear transformations on social media, workout bands are what we see the most. Aside from the slimming power and sweat-boosting benefits, another reason everyone loves workout bands is because they look great on just about anyone! There are a variety of colors and styles to choose from, and they are flattering for any shape or size. Once you start using one, it's hard not to add more to your shapewear wardrobe. Can't decide which waist trainers to choose? We'll help you out. Here are six of our favorite workout bands. This is the newest addition to our collection of workout bands. It embodies everything that Amia is known for: innovative approach to design and an unwavering attention to quality. WHY WE LOVE IT: The durable latex core is specially designed to increase thermal activity and stimulate perspiration in your midsection, making it the perfect complement to your workout wardrobe. 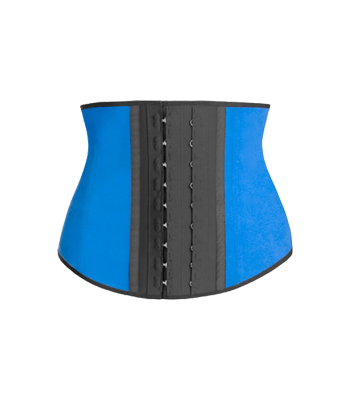 You can also wear the Active Band like as a waist slimming corset underneath other clothing for work or weekend-wear. From the women's shapewear experts at Fajate, this premium waist cincher corset uses firm compression to instantly slim your midsection by up to several inches. WHY WE LOVE IT: Like all good waist trainers, it is designed to increase thermal activity in your core, stimulating perspiration during exercise, sports, walks, runs, and at-home physical activity. It comes in several bright colors, making it perfect for showing off at the gym. This is perhaps one of the most well-known garments in the world of waist training, and it's one that our customers adore. Take it to the gym or for a run outside and let it add impact to your healthy lifestyle routine. WHY WE LOVE IT: It provides ongoing compression around your core, which stimulates thermal activity and ramps up perspiration. Put simply, the band helps ensure that your workout is working for you. This workout band provides instant results and can help increase the intensity of physical activity. WHY WE LOVE IT: As a thermal control waistband, it responds to your body heat. Use it as a sport waistband if you want some extra support and fat-blasting help during your workouts. For you fashion lovers, this waist minimizer is a must-have. You don't even need to break a sweat to look hot, although it is ideal for workouts. The Ann Chery brand is known for maximum quality, and this workout band is no exception. WHY WE LOVE IT: Showcasing two fun animal prints, it is an effective and stylish way to achieve the figure of your dreams. Crafted from natural latex rubber with a soft stretch cotton interior lining, this cincher features lightweight, flexible boning and two columns of comfortable hook-and-eye closures. Just in case you hadn't seen the color you were looking for yet, this garment might have it. Why keep your shapewear covered up when it looks this good? A must-have for instant slimming around your midsection, this stunning girdle provides superior abdominal control. WHY WE LOVE IT: For starters, there are lots of fun color options! The Slim Sport Girdle by Verox Slim is made with resilient latex inside to increase perspiration while wearing it. The girdle comfortably firms the look of your abs, slimming your silhouette and enhancing your curves in all the right places, whether you're at the gym or anywhere else.